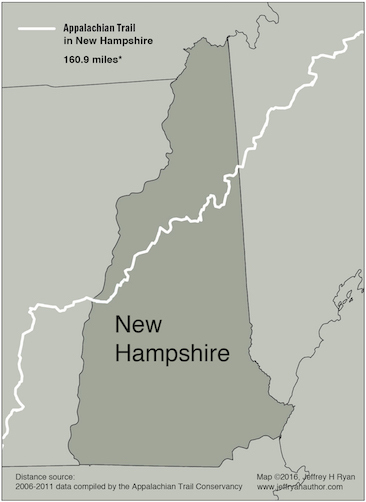 Set foot on any stretch of trail in New Hampshire and you’ll soon understand why it’s known as, “The Granite State”. Rock formations are ubiquitous and responsible for the state’s unforgettable vistas. It is a hiker’s paradise, treating you with long stretches along mountain streams and my favorite—above tree line—where you can scamper above the valley fog and delight in views that span hundreds of miles. The Appalachian Trail leads over the spines of three impressive ranges — the Franconia Range, the Presidential Range, and the Carter-Moriah Range — before crossing the Androscoggin River and entering Maine. Franconia Range (shown above) – Much like the Presidentials, there are long sections of exposed ridgeline, where there is no escape from poor weather conditions, you need to choose your traversing days carefully. Presidential Range – The Presidential peaks create an inspiring set of milestones before you: Jackson, Pierce, Eisenhower, Franklin, Monroe, Washington, Jefferson, Madison, Adams, and Quincy Adams. Many AT hikers arrange to “slack pack” this section, meaning they carry a day pack instead of trying to tackle the significant ups and downs with all of their hiking gear along for the ride. Zealand Notch – While the rails that ran into Zealand Notch from the mid-1880s to 1900 are long gone, the wide, gentle trails that remain in their stead provide exceptional access to the mountains deep within the National Forest’s boundaries. This one isn’t for the out of shape or unprepared. In fact, if you are either, it can be dangerous. The alternative is to utilize Appalachian Mountain Club White Mountain Huts, which provide food and shelter along the way. At 6288′, Mount Washington sits where three weather patterns converge. The highest land speed ever recorded on earth happened here, so you can appreciate how quickly the weather can change. There is no camping allowed above treeline either, so you need to plan carefully. (More details above.) You can also check the weather in advance by visiting the Mount Washington Observatory website. 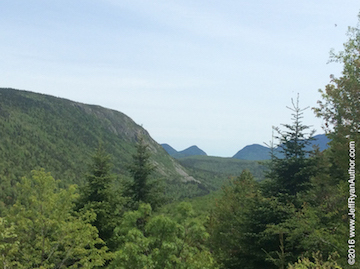 Another fantastic two dozen mile New Hampshire walk is to be found in the Franconia Range. Where else can you take a hike on a historic railroad bed as a warmup, then shoot up 3,000 feet to walk over impressive granite and spruce-topped mountains? The views are hard-earned, but they are among the best on the whole AT. It probably goes without saying, but the ascents and descents in the White Mountains (and New England in general) may require you to reconsider how far you can cover in a day. This is rugged trail over high peaks and the going can be slow due to the terrain and the weather. Slow and steady is the approach I recommend.